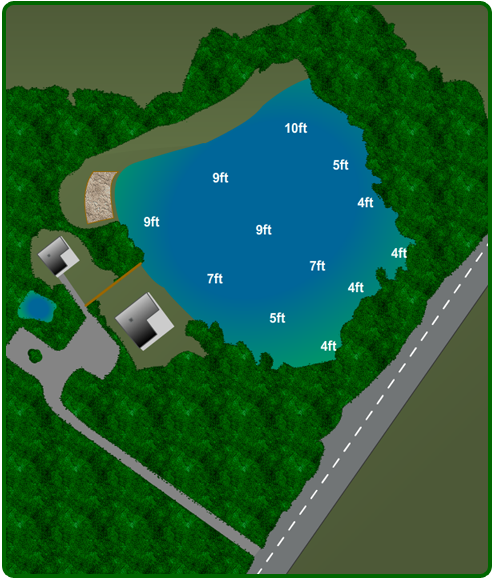 The Exclusive carp fishing lake, two acres in size is set in six acres of woods and grassland and has a dam at one end and is stream fed to ensure the lake remains at full level throughout the year. It is lined with Willows, Silver Birch, various shrubs and Iris Reeds. At the dam, the depth ranges from 10 feet, going down to 4 feet at the road end. The far bank is lined with over hanging trees where the carp love to hang out. We have now changed from two swims to one very large triple which is only a matter of meters from the luxury gite making it ideal for everybody to fish together. It is constructed with gravel and level to ensure maximum comfort. The lake bed is made up of sandstone and clay with some silt pockets mainly in the shallows. The lake is virtually snag free, but we recommend a minimum of 15lb breaking strain line. 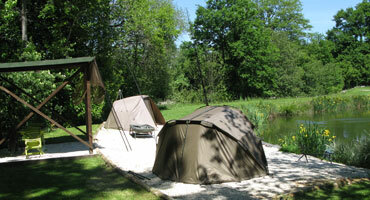 The fishery is suited for 2 to 3 anglers, with a six rod limit (ie 2 people with 3 rods each or 3 people with 2 rods each). We stock Boilies, and pellets available at very competitive prices. No permits are required and night fishing is permitted.